1. Believe it or not, you, your family and your neighbors aren’t the only consumers of electricity. We also have businesses, industry, schools, streetlights, trains etc. 2. Most buildings probably don’t have enough roof top area to produce all the electricity it needs anyway, let alone all of the energy our society need as a whole! 3. Most roofs don’t have the optimum direction/angle towards the sun and shading is a big issue. In a solar park, every panel will be installed in the optimum direction/angle and tracking can be added as well to utilize the solar panels to the maximum. The added electricity generation is easily enough to offset whatever is lost in transmission. 4. You can add hydro, wind and other energy sources to the energy mix. 5. It`s more cost effective to install solar panels in big solar parks. - remove CO2 from the atmosphere. To sum it up:: Big solar parks combined with a high capacity grid is a more flexible way to create and distribute renewable energy. So no more solar rooftop? Not necessarily. But the vast majority of solar panels should in my opinion be installed in solar parks. If a house produce more energy than it consume or is able store in a battery, the solar system is to big. Germanys wind turbines just set a new monthly generation record of 16,6TWh. But is this necessarily a good thing? Not realy. What you want is equally distributed energy production throughout the year. Fun fact 1: The 2018 average monthly wind energy production was 9,28TWh. Fun fact 3: The 2018 average wind power output was 12,72GW. March 2018 average power output was 22,3GW and peak generation was 46,27GW. 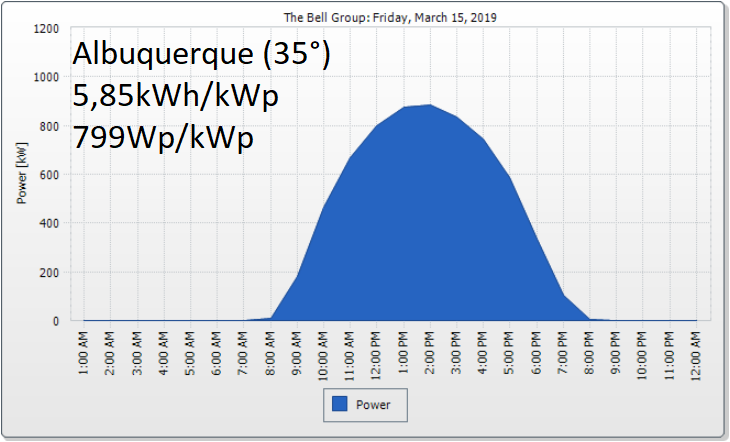 Red line shows the average power output for March 2019. Green line shows the 2018 annual average power. How a hypothetical 100% renewable energy system (wind and solar) would have turned out for Germany in 2018 expressed as percent of average weekly generation (annual generation divided by 52). Fun fact: A total 2.280.000.000.000kg of iron ore was mined globally in 2015 according to wikipedia. Fun Fact 7: Each 6MW turbine can generate enough energy for 3000 people given a per capita electricity consumption of 8760kWh anually and a capacityfactor of 50%. Per capita steelconsumption is 1797kg + 1666kg of iron ore. Thoughts: A cost of 6$ per watt installed is actually not to bad considering wind having superior capacity factor compared to solar (in europe). Also the fact that energy production troughout the year is more equal compared to solar is a BIG advantage which is worth paying for. In terms of steel consumption, a equal sized bottom fixed turbine require about 3 times less steel (not counting the iron ore ballast) which is unfortunate but within what is acceptable. Say hello to the Australian gigagrid. The HVDC lines illustrated one the map (see below) are pretty random, but the idea is to make a bunch of easth to west HVDC power lines with solar and wind parks spread out along the way. (western australia get solar energy earlier in the morning and the eastern states get to enjoy solar energy later in the afternoon well after sunset. - Less seasonal variations if most of the power lines / solar parks are located further north than the major cities. Undocumented fun fact: Solar rooftop is more expensive than solar parks? The money saved will pay for the HVDC lines? Undocumented fun fact 2: The transmission losses are less than the energy gained by installing the solar panels in more sunny locations and with optimum tilt/tracking? Eight day weather forecast for Perth, Alice Springs, Darwin, Adelaide, Sydney Brisbane and Melbourne. Sorry Tasmania! What`s the optimum wind to solar ratio for Germany in order to generate equal ammounts of electricity on a weekly basis troughout the year? Let us see how thing turns out based on how wind and solar performed in 2017. The table below express wind and solar generation as a percentage releative to average weekly electricity generation (EWF = weekly energy factor). A 75/25 ratio seems to be a good fit. This is also close to the current wind to solar ratio which is and have been around 70/30 for serval years. Under is a graphic representation on the wind and solar generation from 2011 to 2018. 1. As more households install solar, the utility companies makes less money, but the cost of maintinging the grid is fixed. This means they have to increase the cost of electricity for those without solar panels. 2. Less utilization of fossil power plants leads to higher cost per kWh generated. 3. If to many households install solar panels, overgeneration will become an issue. When the sun is shining, a solar rooftop system might produce 10 times as much power than the house itself consume. In short, net metering is totaly unsustainable, and so is most other solar policies. For solar energy to become a viable solution, the cost pr kWh electricty will have to vary based on time of day, current weather, weather forecast, time of year and much more. Renewable energy will never work with a fixed price! If you are one of those who think the utility companies is greedy, you are probably right. But if you are defending the net metering policy, I would advise you to educate yourself! Lithium reserves - Do we have enough? Fun Fact(s): Worlds lithium reserves/resource are estimated to be about 53.000.000.000 kg (53 billion kg). In order to produce 1 kWh battery you need approximately 0,15kg lithium. Thats enough lithium to make 353.333.333.333 kWh = 353 TWh of batteries. What can you do with 353 TWh worth of energy storage? - Power the worlds electricity grid to for 6 days. Do we have enough? Well………….. Here are some numbers from a random 3kWp solar rooftop solar installation located in Sydney, Australia! For more information, have a look at this YouTube video.